Don’t miss Jake Miller, MKTO, AJ Mitchell and Elijah Woods x Jamie Fine at the Lincoln Theatre on Saturday, October 20th. We’ll also have a very special appearance by magician Shaun Jay! 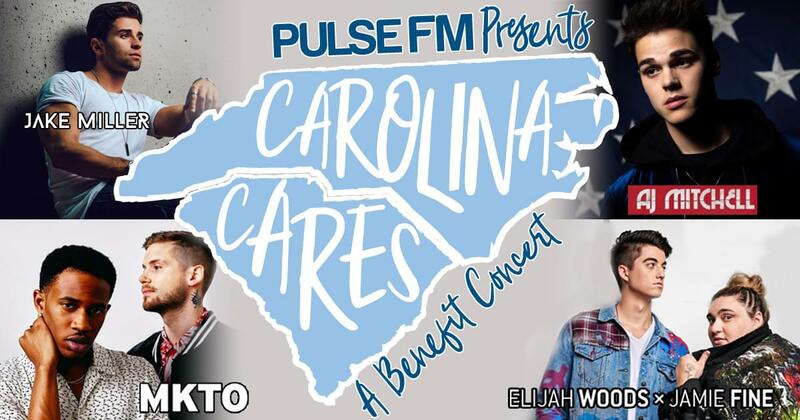 Proceeds benefit the NC Disaster Relief Fund and the American Red Cross. Tickets are just $9.69 in advance. $14 at the door. A limited amount of VIP tickets will also be available for $60. This is an all ages show. VIP package includes:Ticket to the show with early admission, Meet & Greet with artist of your choice and Limited edition t-shirt. Listen all week at 5:15pm to win your tickets and Meet & Greet Passes! Times: Door 6pm. Show 7pm. Be sure to bring cash or your credit cards for our silent auction featuring one-of-a-kind items and experiences. 100% of the money goes to Hurricane Florence Relief. Items include: An autographed Ed Sheeran Guitar, a Kate Spade purse, signed Fifth Harmony vinyl and signed Charli XCX magazine, a 55″ TCL LED 4K UHD Smart TV with HDR Roku, a poster autographed by Selena Gomez, a guitar signed by Niall Horan, a guitar signed by Mike Posner and a MK purse. The NC Disaster Relief Fund is accepting donations to help victims of Florence. Contributions directly help Hurricane Florence victims. Learn more. Your donations help the Red Cross provide shelter, food and comfort to families who have lost their homes due to hurricanes. Learn more.